Sanitation—Flies need manure and other materials for laying their eggs. Trampling and scraping manure, removing standing water and cleaning up spilled feed and silage go a long way toward lessening fly problems. Chemical sprays—Several products are available to supplement sanitation practices. Residual wall sprays last three to four weeks and can be applied to areas where flies rest. Knock-down sprays are a quick but temporary method of fly control. Feed additives—Remember that the active ingredients are deposited in manure, and that’s where they work. They won’t control flies developing in other fly breeding materials. 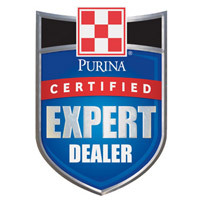 Chemical—Approved chemicals applied by sprays, pour-ons, spot-ons and squirt-ons are effective. Because the active ingredients in these products usually wear off in about 30 days, treatments need to be repeated once a month. Forced-Use—These methods include back rubbers and dust bags. Cattle need to use these daily for them to work, so place them directly in front of food or water. Feed Additives—Approved feed additives can control fly larvae developing in cattle manure. 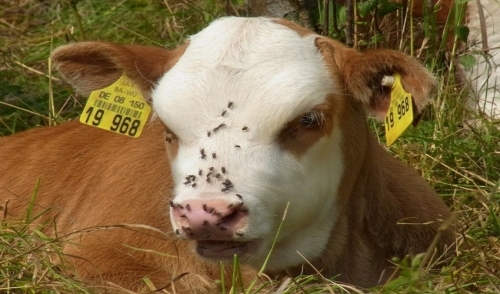 Ear tags—Resistance has become a concern, but ear tags remain a viable option for fly control. Alternate the use of pyrethroid tags with organophosphate tags every other year. Mechanical controls—Harrowing pastures regularly breaks up manure and kills fly eggs and larvae.